Beware of the Seven is a coalition of the seven law enforcement agencies with jurisdiction in South Placer County. 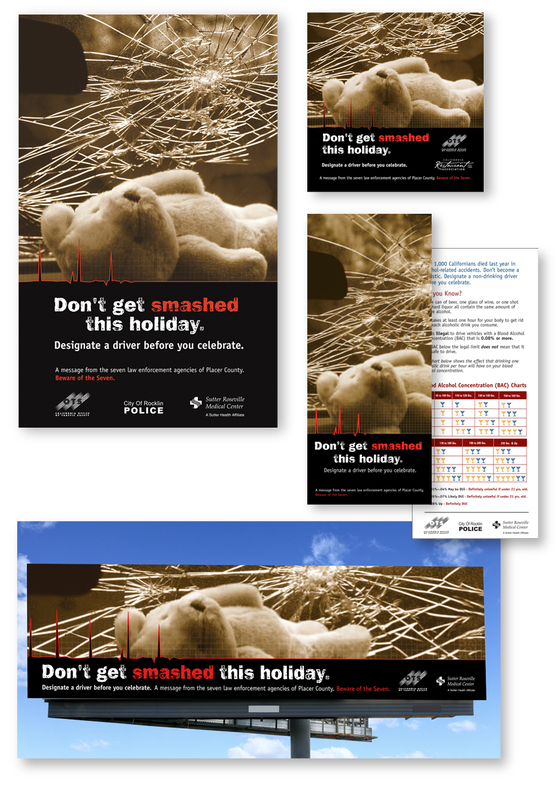 The coalition’s primary goal is to decrease the number of alcohol-related fatalities and injuries during peak holiday periods. Under a grant from the California Office of Traffic Safety (OTS), the coalition was required to develop a comprehensive campaign to effectively educate and inform the general community regarding the laws, consequences, and issues related to driving under the influence of alcohol and/or drugs. Bouchard was hired by the Rocklin Police Department, as the lead agency for the 2004/2005 Beware of the Seven Coalition, to develop and implement a comprehensive public awareness strategy for their anti-DUI measures. To enhance the effectiveness of the campaign (which kicked-off in December 2004 and ran through Labor Day of 2005), Bouchard successfully negotiated financial sponsorships by several key community businesses and organizations, as well as a statewide association and a major healthcare service provider. The funds generated through these sponsorships were added to the grant funds provided by OTS, enabling broader reach and exposure of the campaign message throughout the community. Bouchard’s public information materials featured a hard-hitting visual with direct and factual information about the effects of driving under the influence. This creative strategy was incorporated into advertising on regional bus ads, newspaper ads, posters,“table tents” for distribution to area restaurants and bars, and “take one” flyers, which were distributed at community events and also served as statement stuffers in regional utility bills. A speaker’s bureau was also developed. Bouchard held an opening news conference, which featured comments from the Chiefs of Police of the three largest communities, as well as an address from a representative from OTS. A vehicle that had been involved in a DUI crash was the backdrop for the event. The news conference resulted in news stories on three of Sacramento’s largest television stations (KCRA, KOVR and KMAX,) as well as news stories on Sacramento’s number one rated radio news program (KFBK) and a National Public Radio affiliate. In addition, print stories appeared in several community newspapers. Prior to the campaign launch, Bouchard secured financial sponsorships and in-kind support from community businesses totaling more than $55,000. Beware of the Seven campaign sponsors included: Sutter Roseville Medical Center, The Sacramento Bee, Gold Country Media, Starstream Communications, Roseville Transit and the California Restaurant Association. In addition, a variety of regional utility companies agreed to include the Beware of the Seven public awareness materials in their billing statements.